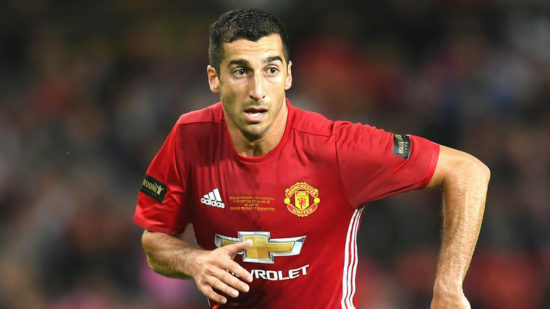 Manchester United in recent days have been reported to demand around £35m from any club that wants the services of Armenian star, Henrikh Mkhitaryan. The player has fallen out with manager, Jose Mourinho and it looks as though there is no future for him at Old Trafford, as Mourinho has been coy on giving assurances about his future. There are a number of players that have also been linked to the club’s exit door, and we take a look at three of such players. The shotstopper proved to be an able deputy for first choice goal keeper, David de Gea last term but has failed to play often this season. The Argentina International wants regular playing time ahead of a World Cup Year, as he knows that not playing regularly could dampen his chances of playing as first choice for the Albiceleste. The 29 year old was preferred in the Europa League and other cup competitions last term, but has barely featured this campaign as De Gea has been used in all competitions, and the Spanish No. 1 has been excellent, making string after string of saves. England defender, Luke Shaw may also be looking at moving away from The Theatre of Dreams in a bid to make the England squad for the World Cup in Russia. The 22 year old has struggled with injuries ever since his arrival from Southampton in 2014, and has barely featured this season due to injuries, lack of form and the re-emergence of Ashley Young. The player is not the favourite of manager, Jose Mourinho and needs to leave to get his confidence back. A number of clubs have been mentioned, but his decision making must be careful as his next move will be pivotal for the benefit of his career. 30 year old Belgian star, Marouane Fellaini is a personal favourite of Jose Mourinho but his future at the club is shrouded in mystery. His contract expires at the end of the season, and it is looking increasingly likely that he will be let go in January, as the club don’t want to lose him on a free in the summer. United are not willing to give him a massive pay rise, which the player believes he deserves. He is currently injured, and has been missed given that the player he predominantly replaces, Paul Pogba has been currently injured. Mourinho has said that every player has a price. Just like Memphis Depay and Morgan Schneiderlin left the club midway last season, these players have a big decision concerning their futures. If they leave, they will be missed at the club as they have represented our club with the highest of commitment. Mkhitaryan, Herrera, Jones, Fellaini, Smalling, Young, Valencia, Darmian, Rojo, that is nine from the team squad who are sub standard or getting past it. City over ran the United defence and mid field recently because they have no young energetic players in mid field or defence. Better teams will expose United until they over haul these players.